When you have a missing tooth, dentures are a removable teeth replacement that is used to fill that gap. The two main types of dentures are full dentures and partial dentures. 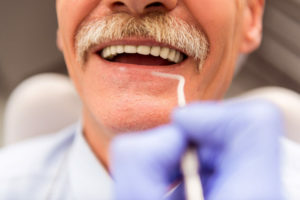 Dentures are made in a dental laboratory after an impression of your gums is taken. These are the main types of full dentures; ask your dentist about which one is the best for you. Conventional Dentures: These are made only after the teeth have been removed and the gum tissue has healed. They will be available sometime after the impression was taken. Immediate Dentures: These are made in advance and can be used right after the teeth are removed. The advantage is that the patient is not left without teeth for 2 to 3 months. However, after teeth removal, the gums shrink over time and the denture may not fit as snugly anymore. This is why immediate dentures are suggested to be used temporarily. Partial Dentures or Bridge: A partial denture or bridge is used when there are still permanent teeth left. A bridge connects one or more artificial tooth adjacent to a permanent tooth. The benefit is that it fills in the gap, and at the same time it prevents the other permanent tooth from moving. Having dentures does not feel the same as having natural teeth and it takes time to get used to. It may feel bulky at first but you will get used to it with a little practice. Dentures are prone to wear and tear. Your gums and mouth muscles also change over time resulting in a loose fit of your dentures. You need to see your dentist around once a year to have your dentures checked, adjusted, and remade if needed. You should also handle your dentures with care to avoid breakage.